Element #104 was made independently by an American group at Berkeley and a Russian group at Dubna. 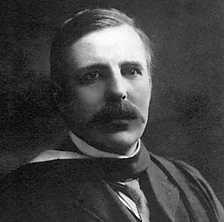 The Americans proposed the name Rutherfordium (Rf) after Ernest Rutherford. The Russians proposed the name Kurtchatovium (Ku) after Igor Kurtchatov (1903-1960), a Russian atomic physicist. The IUPAC-IUPAP committee considered claims for priority for many years. Rutherford (1871-1937) was born in Nelson, New Zealand, the most remote of British provinces. He studied at Canterbury College in New Zealand. He was runner up for a scholarship to Cambridge University in England, but the prime candidate chose marriage, allowing Rutherford the opportunity. Rutherford taught at McGill University in Canada, then returned to England's Universities of Manchester and later Cambridge. Rutherford distinguished and named alpha (α) and beta radiation (β). In 1902 he proposed the theory of atomic transmutation, explaining radioactive decay. For this he received the 1908 Nobel prize for chemistry. When his students found alpha rays occasionally reflect from Gold foil, Rutherford proposed the necessity for each atom to have a tiny, massive core which he named the nucleus. Rutherford caused the first man-made radioactive decay in 1919 by bombarding nitrogen with alpha particles, producing protons. This became the basis for all of nuclear physics that followed. C.P.Snow described Rutherford as a big, rather clumsy man, with a substantial bay-window that started in the middle of the chest. He didn't look in the least like an intellectual. But no one could have enjoyed himself more, either in creative work or the honors it brought him. He worked hard, but with immense gusto. His insight was direct, his intuition, with one exception, infallible. No scientist has made fewer mistakes. He was as original as Einstein, but he did not revolt against formal instruction. By thirty he had set going the science of nuclear physics-single-handed, in the isolation of late-Victorian Montreal. By forty in Manchester, he had found the structure of the atom on which all modern nuclear physics depends. Many who knew Rutherford thought him the greatest experimental scientist of the Century. Rutherford made Cambridge in the 1920s and 1930s the metropolis of experimental physics for the world. Americans who studied there brought back Rutherford's mixture of experiment and theory that started the technological revolution that made the United States the top country in the world. Science under the leadership of Rutherford and his peers became the greatest single force for change since the discovery of agriculture. They not only accepted this role for science, but they rejoiced in it. They viewed the scientific-technical-industrial revolution as doing incomparably more good than harm. Rutherford himself never built the great machines of particle physics, though some of his pupils started them. Rutherford himself worked with bizarrely simple apparatus. He once proclaimed: ´I could do research at the North Pole.´ His researches remain the last supreme single-handed achievement in fundamental physics ...in the Cavendish phrase-with sealing wax and string.